ITF (“Into the Future”) Corp will be headquartered in Hong Kong but also currently has offices in Singapore, and has applied for licences in both jurisdictions. It plans to begin operations next year. It was founded by Lim Hui Jie (right, in the photo above, with Jim Rogers and Ignious Yong, left), who was chief executive of Singapore-based, Australian Securities Exchange-listed Digimatic Group, until March. ITF calls itself “the world’s first fintech bank”, and says it aims to “bring financial freedom to the masses through better financial accessibility, financial and business opportunities, and financial literacy”. It aims to do this by providing online and mobile banking and financial services, while also working with other fintech companies in the region to develop products and services. The launch comes as both Hong Kong and Singapore – as well as most other major financial services jurisdictions – have formally declared their intentions of becoming fintech hubs, in an effort to lay claim to a first mover advantage in what is widely seen as the future direction of the global financial services industry. 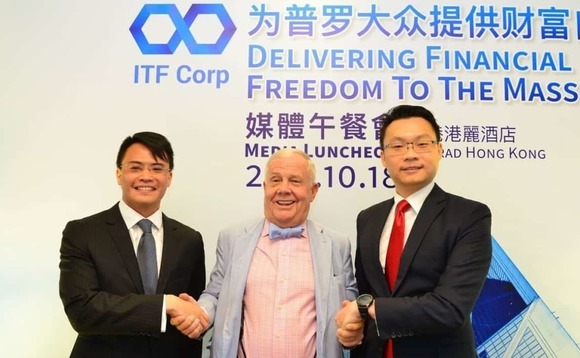 At an event marking the company’s official launch at the Conrad Hotel in Hong Kong on Wednesday, Lim said the city had been chosen as the base for ITF because of its proximity “to the largest market in the world – China”. “We aim to be an international fintech company, and Hong Kong has the regulatory and market conditions to help us achieve our goal as Hong Kong is a very international market,” Lim added, according to the South China Morning Post, which covered the event. In addition to Rogers, other investors in ITF include George Lam, the chairman of Cyberport Management Hong Kong, the SCMP said. The company’s offices are located in the Tsuen Wan district of the New Territories, opposite Tsing Yi Island. Rogers, whose other claims to fame include having predicted the commodities “super cycle” that began around 2000, said he had invested in ITF because he saw fintech as the inevitable future of banking, as it replaced such traditional elements of banking as traditional banking branches and cash. “Fin tech is obviously going to change everything,” he told International Investment. As part of ITF’s strategy of establishing a global footprint as soon as possible, it has already set up business arrangements with financial services entities in, for example, Vanuatu, which is awaiting regulatory approval, and correspondent banking relationships with the Bank of Communications Shanghai and Bank of Communications Hong Kong, according to the SCMP. Hong Kong has been riding the global fintech juggernaut with some determination for the last few years, with the backing of such local regulatory bodies as the Hong Kong Monetary Authority and the Securities & Futures Commission. At a banking industry conference last month, for example, the HKMA announced seven initiatives it said would open up a “new era of banking” by “embrac[ing] the enormous opportunities brought about by the convergence of banking and technology”. As reported, the SFC signed an agreement in August to work with the Dubai Financial Services Authority in encouraging the development of the two jurisdictions’ fintech industries, through, for example, the pooling of resources; this followed the signing of a similar agreement between Hong Kong and the UK in December 2016, and again last month. Last month also saw the Hong Kong IPO of a Shanghai-based “insurtech” online insurance company, ZhongAn Online Property & Casualty Insurance Co., which was said by the Chinese media to have been “nearly 400 times oversubscribed” when it finally was priced at the top of its estimated range. The shares then leapt more than 18% in their first day of trading. A major regional fintech event, Hong Kong Fintech Week, is due to take place later this month at the Hong Kong Convention & Exhibition Centre, where scheduled speakers include executives from Tencent China, Baidu China, Ping An Group China, ZhongAn and Pay Pal India, as well as HKMA and S&FC officials.